I made a different dumpling every weekend for a month and this is what happened. That is the alternate title for this post. While the rest of the internet was partaking in Whole30 or dry January, I was making dumplings for a whole month. One of my New Year's resolutions was to make more food that I love. Not that I don't love all the recipes that I post on here. I just really wanted to make it priority to share recipes that turn me into the blushing/smiling emoji. That means a lot of dumplings, noodles, and cake. So I decided to spend the entire month of January creating/testing/flopping/eating dumplings leading up to Chinese New Year. Which is 1.5 weeks away! Hooray! In case you missed any of the recent dumpling recipes, I made Crab and Mushroom Wontons in Chili Oil, Shrimp Dumplings (Har Gow), Spiced Turkey Momos, and these here Vegetarian Turmeric Potstickers. My fingers are twitching just a little thinking about all the dumplings I folded in January. But there is a dumpling recipe for everyone now! So there really isn't a reason why you shouldn't be scheduling a dumpling making session in the near future. I realized that I actually learned a lot from making a billion dumplings. Okay, I actually only made like 100. 1. An ugly dumpling is still a delicious dumpling. I'm not going to lie to you guys. Dumpling folds are hard. Who knew there are so many dumpling folds out there?! I made things 100x difficult for myself by doing a different fold for each dumpling. With each recipe the first couple dumplings were always duds. It's sort of like pancakes. The first one is always underdone and slightly burnt at the same time. But as you continue to push through the internal stress building up in you and your fingers start to shake a little, your dumplings will eventually start to look better. It just takes time and patiences. With each fold and each pleat, your fingers will get more comfortable with the motions. Even if your whole batch looks like a bunch of oblong doughy meatballs, they will still taste amazing! Shape does not affect flavor. 2. Enjoy the monotony. When I make dumplings with my family it tends to go by pretty quickly. Mainly because there are at least 3 or 4 of us folding together. In my little SF kitchen there is just me. Reuben helps out more with the cooking aspect. So I find myself alone folding most of the time. I really don't mind it though. It is meditative in a weird way. It feels really great to not have to think about anything other than the little motions of folding a dumpling. I think it is because Monday through Friday, I am constantly trying to solve problems or trying to convince contractors to do things for me. So it feels great for the brain when the only real problem at the moment is trying to get a tight seal on your pleats. And a dumpling doesn't talk back at you and tell you can't move something to where you want to move it. 3. It is okay to use store bought wrappers. It hurts me to say that. Only because I LOVE a thick and doughy dumpling wrapper. My dad's potsticker wrappers are the absolute best and it is because the dough is just so good. You really can't recreate that texture with store bough wrappers. It's just different. Not bad. Just different. I ended up making my own dough for all my recipes, with the exception being the wontons. It is definitely worth it if you have the time and patience to make your own dough. But I realized that sometimes, you just ain't got the time! My day job has been getting more and more hectic, so I've been appreciating any shortcut I can get in the dumpling department. Jumping back to lesson #1, it is still going to taste good! I'll be taking a little break from making dumplings for a while. I didn't say eating dumplings though. Still eating them on a weekly basis! 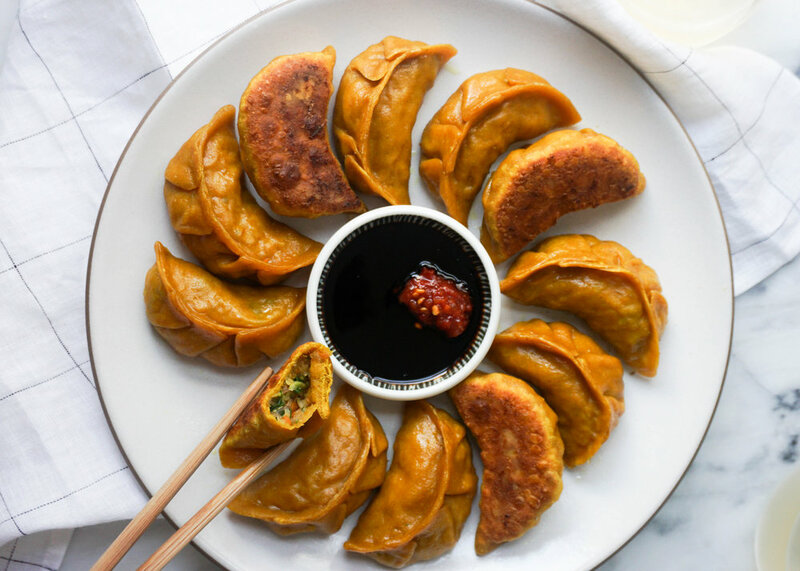 Before I move on to more noodles and cakes, let me talk about these vegetarian friendly potstickers! The dough is spiced with a bit of turmeric to give it that pretty golden color. It doesn't affect the flavor too much, but you probably get an itty bitty amount of the health benefits from turmeric. The filling is packed with carrots, cabbage, zucchini, and cellophane noodles. The veggies add health, texture, and much needed moister and body to the filling. Cellophane noodles are a traditional filler used in vegetarian dumplings. You might also know them as bean thread noodles. They take like no time to cook and absorb a ton of flavor! You can find them at your local asian market packaged in little bundles. You can fold the potstickers in whatever fold you feel comfortable with. I folded these in a two directional crescent fold, which makes them look like little moons. Link to a helpful video below. The dumplings get a nice sear in a skillet for that characteristic crunchy bottom and then steam for a few minutes in the pan to get everything else all cooked and ready for optimal deliciousness. It seems contradictory, but trust me. It works. You'll have yourself a potsticker! Oh! I literally just realized that these potstickers are vegan too!! Double health points! Ok, I give you permission to eat as many of these as you want. Place one bundle of dried cellophane/bean thread in a heat proof bowl. Pour boiling water over the noodles until the noodles are submerged. Steep the noodles in the hot water for 5 minutes. Drain and rinse noodles under cold water. Place noodles back in a dry mixing bowl. Cut up the noodles into smaller pieces with kitchen scissors or a knife. Finely chop the carrot, zucchini and cabbage. Alternatively, you can process all the vegetables in a food processor to get nice consistent sizes and save loads of time. Add the vegetables, green onions, garlic, oyster sauce, salt, white pepper, and sesame oil to the bowl of noodles. Give everything a good mix and allow the filling to sit for at least 15 minutes to allow the flavors to develop. To prepare your dough, place flour and turmeric in a large bowl. Give it a good mix. Create a well in center and slowly pour in the just boiled water. Stir the water into the flour with a wooden spoon. Once all the water has been absorbed, start kneading by hand. Knead either in the bowl or on a lightly floured surface for 4 minutes until you get a smooth and consistent ball of dough. Place dough ball in a ziplock bag and allow to rest for at least 15 minutes. The dough will slightly steam in the bag and make it easier to work with. Roll out the other half into a 1" think rope. Divide the rope into 12 equal pieces. 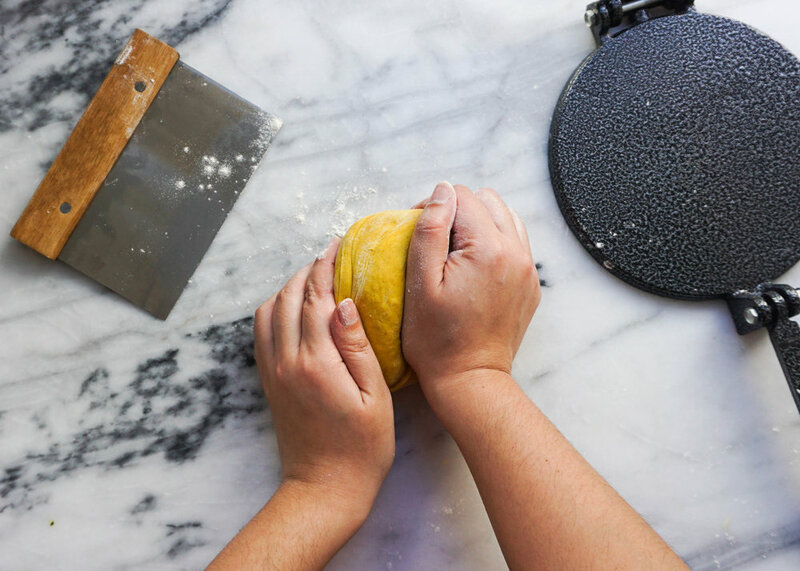 With a small rolling pin, roll out each piece into 3" to 3 1/2" discs. If the dough starts to stick just sprinkle some flour on your surface and the rolling pin. Alternatively, you could use a tortilla press to make your wrappers. I find that you still have to using the rolling pin a little to get it thin enough. Place a heaping teaspoon of filling (you can adjust based on the size of your wrappers) in the middle of the wrapper. 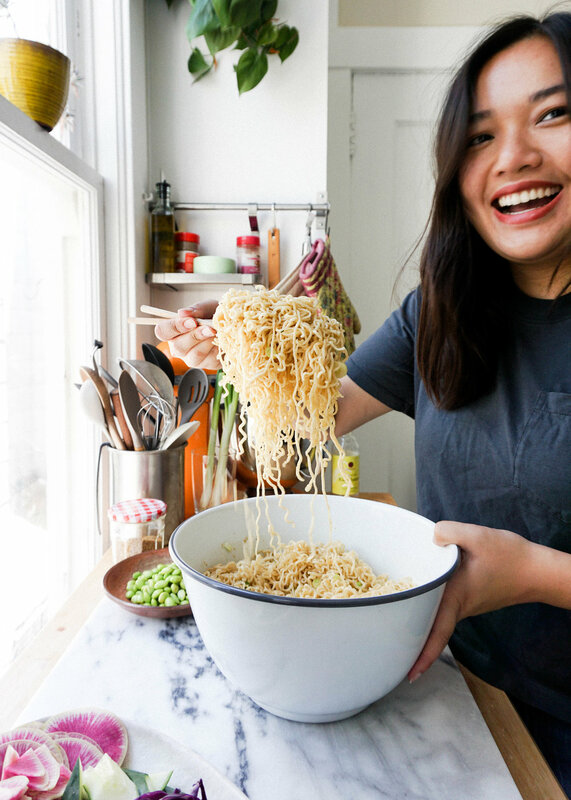 The noodles can get a little fussy but just be patient and try to make tight bundles. Fold the dumpling by creating pleats on one side of the dumpling. Firming pinching each pleat for a tight seal. Here is a helpful folding video! These dumplings are the two directional crescent fold at the end of the video. Place folded dumplings on a flour dusted baking sheet and cover with a kitchen towel while you fold the rest. Heat 1 tbsp of olive oil in a skillet (with fitted lid) over medium high heat. Arrange dumplings in the skillet with the flat side down. Sear the bottoms of the dumplings for 2 minutes. Do not tough them. Add in 1/4 cup water and cover the skillet with the lid. Allow the dumplings to steam for 5 minutes, until all the water has evaporated. Remove the lid and let the dumplings sear in the pan for another minute. The bottoms of the dumplings should be golden brown and crispy. Remove from pan and allow to slightly cool before eating. Serve with dark soy and hot sauce.